Supplementary material is available for this article at https://doi.org/10.1007/s12603-018-1122-5 and is accessible for authorized users. Supplementary material, approximately 19.3 KB. Li M, Shi Z. Dietary Pattern during 1991–2011 and its association with cardio metabolic risks in Chinese adults: The China Health and Nutrition Survey. Nutrients. 2017;9(11). doi: https://doi.org/10.3390/nu9111218. 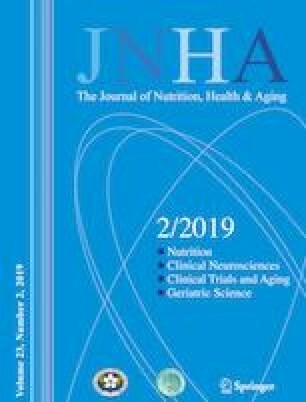 Shi Z, Li M, Wang Y, Liu J, El-Obeid T. High iron intake is associated with poor cognition among Chinese old adults, and varied by weight status—A 15-year longitudinal study among 4852 adults. doi: https://doi.org/10.1093/ajcn/nqy254. International Nut & Dried Fruit. Nuts and dried fruits. Statistical yearbook 2017/2018. https://doi.org/www.nutfruit.org/who-we-are/news-and.../inc-2017-2018-statistical-yearbook (accessed on 18th May 2018). USDA Foreign Agricultural Service; US Department of Agriculture. Tree Nuts: World Markets and Trade. 2017. https://doi.org/www.statista.com/statistics/675987/walnut-production-share-worldwide-by-country/(accessed on 18th May 2018).